As collision repair diagnostics continues to take center stage in the collision repair industry, there has been a level of confusion over some common terms. In an effort to publish inter-industry developed and vetted definitions on three common terms (pre-scan, post-scan, and post-repair calibration), I-CAR gathered a number of subject matter experts (SME) from vehicle manufactures, collision repairers, insurance personnel, and scan tool manufactures. This group of SMEs met in early August, during the International Autobody Congress & Exposition (NACE), to develop and review the following definitions. Following NACE, the draft definitions were sent to the group for review and edits. 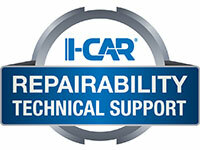 I-CAR personnel collected and updated the definitions and then sent them out for final review. The definitions are now final. Please note, these basic definitions, developed and vetted by the collision repair inter-industry, and published by I-CAR, do not represent an all-inclusive list of collision repair diagnostic definitions or tasks. These definitions do not include diagnostic troubleshooting or repair, nor are they meant to represent when, or how, collision repair diagnostics should be performed. Always refer to OEM information for scanning, calibration, and tool and equipment requirements. These definitions are intended to differentiate tasks associated with collision repair diagnostics and serve as a foundation for industry professionals. A step in the damage analysis/blueprinting process used to identify errors, faults, and/or damage related, and unrelated, to the collision. Pre-scanning is also done to capture diagnostic trouble codes (DTCs). A pre-scan is not possible if the 12-volt electrical system and vehicle communication networks are disabled or cannot be maintained throughout the scan. If a pre-scan is not possible because of vehicle damage, it should be done as soon as repair progress allows it to be done safely. A post-repair, quality control process used to ensure all vehicle system diagnostic trouble codes (DTCs), related and unrelated to the collision, and those set during the repair, have been identified and cleared. A test drive may be required prior to clearing some codes; some codes may only appear after certain driving distances, key cycles, or other enable criteria have been reached. A required step following the removal, installation, and/or repair of many safety and driver convenience system parts. PRC/I may also be required if there is damage/trauma to the mounting location(s), R&I or R&R of the cameras/sensors/mounting locations, R&I or R&R of parts in front of, or behind, cameras and/or sensors, or R&R or R&I of closure/trim panels. Access to OEM information is mandatory to determine if post-repair calibration is required. A scan tool that has been confirmed by the tool’s provider to have the required initialization/calibration capabilities for the vehicle and model year involved, special tools, and/or a test drive following vehicle maker established parameters may also required. Post-repair calibration/initialization may also be referred to as aiming, health check, module setup, relearn, zero-point calibration, initiation, or calibration.